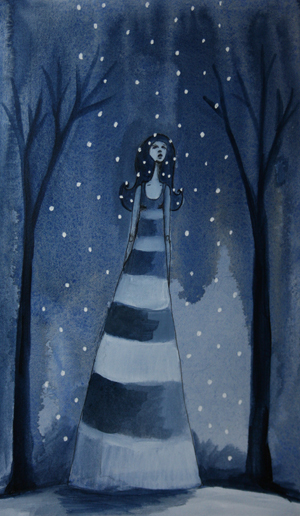 Hanging out with slushy snow today inspired this dark blue piece. I had trouble getting this one to go along with me for awhile, but it came together in the end. Another benefit to AEDM, it helps me stick with something when I might have thrown in the towel to return to it (or not) another time! I continue to feel sadness for those of you living on the east coast. What horrible weather you are facing. As if it couldn’t get any worse!! Love your interpretation of the day, at least. I have never been much of a “series” artist, but I think you are on to something with the AEDM as inspiration for playing around with themes and building off creativity from one day to the next. This is the first time I’ve ever consciously told myself, “Okay, I need to make an effort to record my art projects everyday.” I’m already notice a more disciplined approach to my own work. Gorgeous!! Loving your snow paintings! knowing blue is my favorite color….I find myself drawn to your paintings immediately. This adds a lovely layer to my mornings. Her expression reminds me of someone. Wow look what happens when we push through what I call the “messy middle.” This is lovely. I can see it in a storybook. i love the moody, lonely feel of this one. she looks like she’s craning her neck to find someone. and with the elongated body and dark shades, it has a kind of tim burtonesque feel to it. very cool. What dicipline it takes to set a task and then move to make it happen. Surely posing your intentions has helped focus you and keep you motivated every day. I am inspired. Painting or creating in any way with an intention and purpose makes a beautiful visual reflection. Thank you. This one has such atmosphere to it, your pieces are truly wonderful Leah, always such a pleasure to discover them. Oh my goodness, Leah, how perfectly you capture the mood of a snowy day! Thank you so much for this opportunity. That’s an inner obligation that helps get on track. Your illustration is gorgeous.